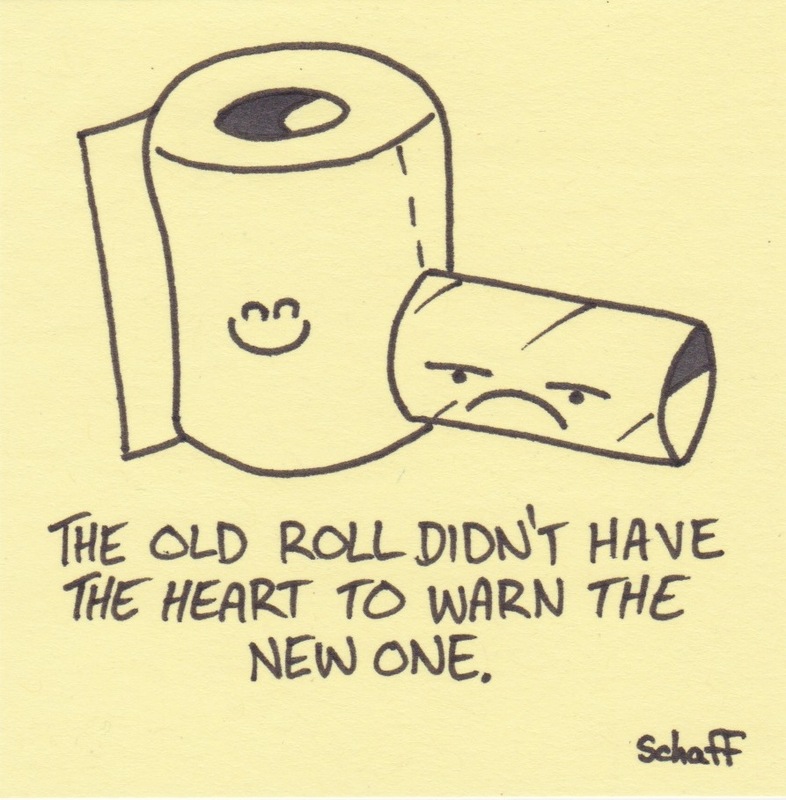 The old roll didn’t have the heart to warn the new one. When my wife and I were newly married, we rented an apartment containing two bedrooms, a small kitchen, and an absolutely minuscule bathroom. The bathroom was so tiny that it was nearly impossible for two people to stand back to back between the tub and the sink. One day I was shaving at the sink while my wife was standing at the bathroom door talking. During a short lull in the conversation I felt a gentle scuffing on my heel. The mirror was fogged over from the steam, but I assumed that my wife was trying to slip behind me so I scooted forward as much as possible to give her room. I continued shaving until I felt the small scratching sensation again. As I attempted to squeeze even further against the sink, I saw someone out of the corner of my eye. It was my wife – still in the doorway. In fact, she wasn’t moving at all. She was frozen in place. Then, her eyes (which had been focused on the floor behind me) slowly moved up and met mine. Before I could ask what was wrong, I felt yet another bump on my heel. I turned quickly and saw a small brown mouse nuzzling against the back of my bare foot. After a series of impressive jumps, kicks, and manly pirouettes, I was finally able to catch my breath and ask my wife why she didn’t tell me about the mouse caressing my foot. Or, better yet, why she watched it do so three separate times?! She couldn’t give me a good reason. In fact, it’s been nine years and she still hasn’t. 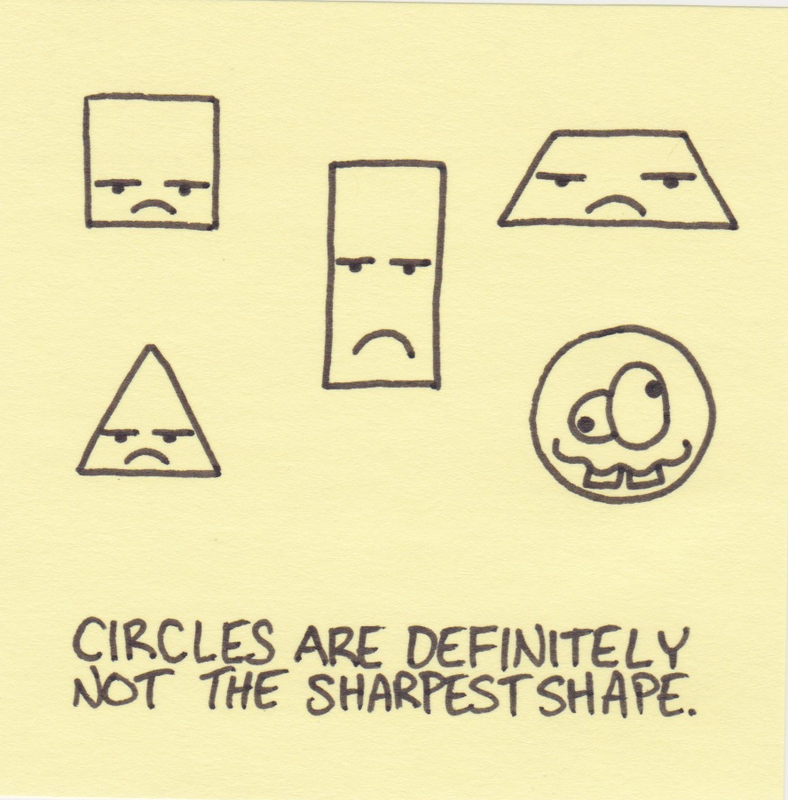 Circles are definitely not the sharpest shapes. What’s not cool is finding people taking credit for them. Or even worse selling products decorated with my little drawings. Over the past few weeks I have found hats, shirts, stickers, mugs, phone cases, and many other products with one of the many cartoons I’ve drawn. I guess I should have known better. Putting unsigned content online means that it can be posted and reposted from site to site and the original source can be lost if not cited each time. Like I said, I’m not feeling so sharp. So… rather than focus on the problem, I’m going straight to solution! I have started signing my drawings so that I can retain some amount of ownership as they move out through the world wide web. I’m feeling smarter already! 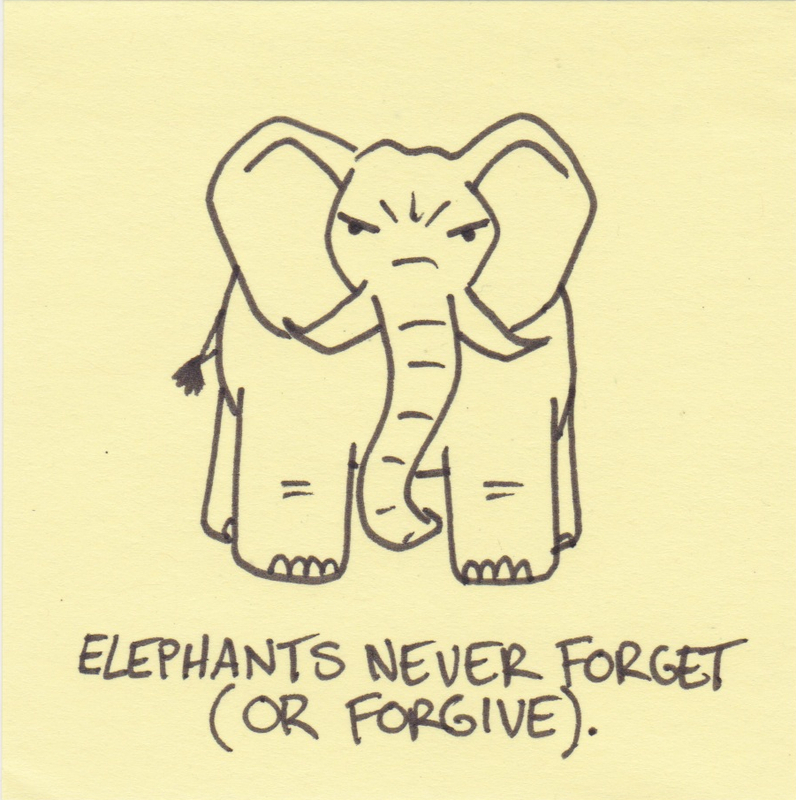 Elephants never forget (or forgive). When I was 2 or 3 years old, my parents took my older brother and I to a renaissance fair. It is actually one of my earliest memories. There was a log rolling contest that my brother won, but I don’t remember. There was jousting and sword play by knights in full armor, but I don’t remember that either. What I do remember is riding on the back of an elephant. I remember it very clearly. If you have ever been on a horse, you are familiar with the up and down bouncing motion that riders experience. The elephant was entirely different. I remember it involved something more like swaying left and right of center as it moved. Thinking about it now, I realize that many of my earliest memories are things that either shocked or frightened me (being attacked by a goose, choking on a hotdog, crashing my tricycle while being chased by a gorilla, etc…). Somehow, the more powerful emotions helped the experiences seat more firmly in my long-term memory. I know that I had a wonderful early childhood filled with special, one-of-a-kind moments… I just can’t seem to actually recall them. 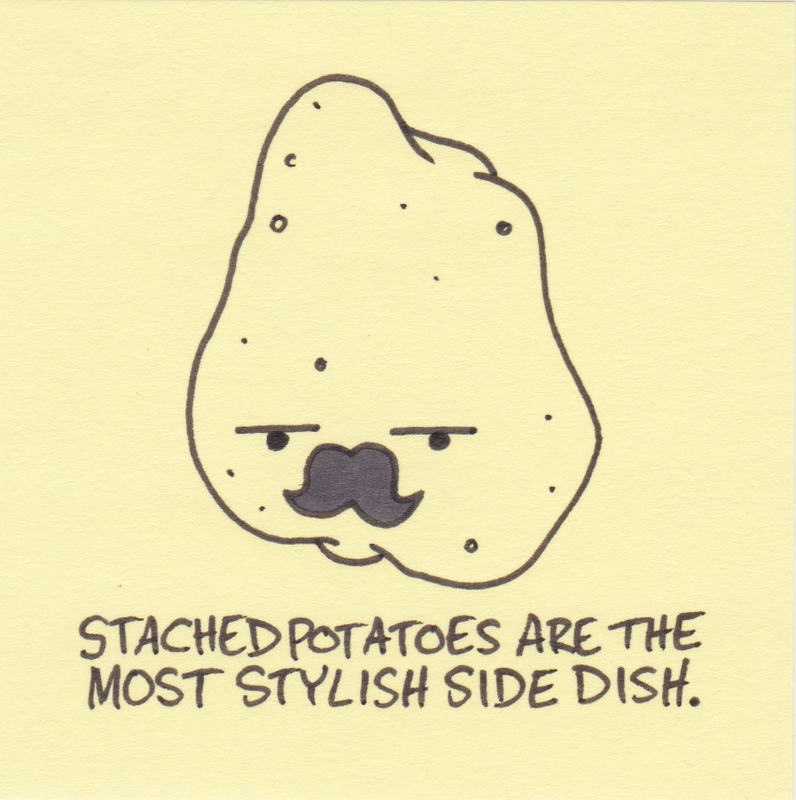 Stached potatoes are the most stylish side dish. Last summer we did quite a bit of gardening around our house. Cucumbers, tomatoes, carrots, spinach, peas, squash, and potatoes. Although everything did well, the potatoes were the most successful element. We pulled up about 150-200 pounds worth of Chieftain Red, German butterball, Yukon Gold, and Bake King potatoes. What’s even more impressive is that we ate the last ones tonight. You are currently browsing the Inkjot blog archives for January, 2013.